What Jewels Are You Wearing? I have always been fascinated with jewelry. When I learned a few years ago that the meaning of my given name “Candice” is glittering, shining, and sparkling, then it all made perfect sense. As a little girl I used to go into my grandmother’s bedroom, open up the lid of her jewelry box on top of her dresser, and just delight in all of her jewelry. Most of it was costume jewelry, but that did not matter to me. 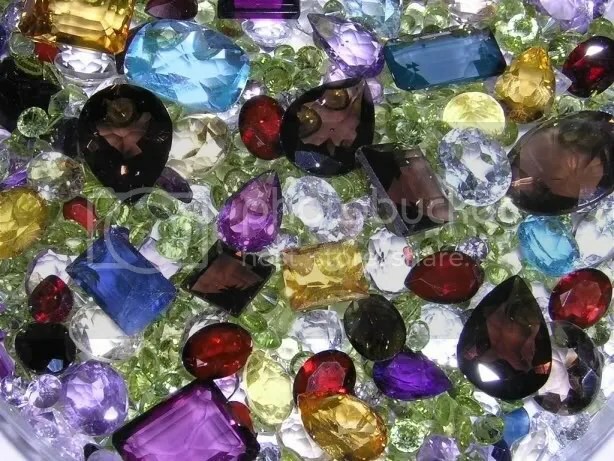 Those beautiful colored stones glistened and sparkled like real jewels. My favorite piece was her man-made ruby ring that was given to her by her parents for her high school graduation. She knew how much I loved that ring and before she died she gave it to me. I still wear it to this day. It’s a memorial of her life. So, whenever the Bible mentions jewels, it immediately has my attention. This morning as I listened to the reading on Daily Audio Bible Isaiah 49:18B said, “As I live – this is my declaration to you – you shall wear all your children as jewelry and put them on as a bride does.” (Holman Christian Standard Bible) What a beautiful word picture and I began to think about the jewels that I am wearing and how even more precious each of my four daughter stones has become to me since their dad went to heaven. Leah is the radiant shepherdess jewel who gathered her dad and I up in her arms and carried us through the last few months of his life. The gem of her life shone brightly like a beacon light that we knew would always be there for us. Annissa is the jewel of wisdom with endless depths. Her stone brings much delight as it throws out the light of who God is and what He is all about. She and her dad would have the best and deepest conversations as the brilliance of her stone shone brightest onto the most beautiful jewel of all – GOD. Charity is the shining star jewel whose luster shines greatest when she opens her heart in song. Like a nightingale who sings during the night when no other birds are singing and sings loudly to overcome the background noises of the trials of life, she kept bringing her dad and I back to God who was walking with us through that dark valley. Tshanina is the many faceted jewel whose gleam brings joy and delight. Her stone lights up any room that she enters. The rays of her beaming jewel brought her dad hope and comfort even in his most trying hour. Now I wear these four luminous jewels of great luster and brilliance around my neck. These daughters are the priceless treasures that God has gifted to me. They continue to be the jewels that God made them to be and are walking together with me in this new chapter of my life and theirs. What a treasure and comfort they are to me and how very, very blessed I am to wear them. Whenever I wonder what glories my husband Bob is seeing in heaven, my first thoughts always go to all those jewels of the foundation of heaven that God talks about in Revelation 21. My daughters and I all have a special made “Heaven” bracelet that contains each of those colorful foundation jewels as well as the gold signifying the streets of gold and the pearls of the gates of heaven. This bracelet reminds us where Bob resides now and that we will see him again some day. Think about the jewels in your life. Perhaps you don’t have children. Your jewels may be a sister, brother, or dear friend/s God has given you. What kind of radiance are they shining into your life? Have you told them how much they are blessing you and thanked them for it? When my husband died, it was personal and for a few days until we buried him, everything seemed focused on my needs and wants. My grief is personal and that part is also about me. It’s nothing that can really be shared with anyone else in my life. I find it is hard in a way not to have my thoughts centered on me and I think that is because I have been thrown into this strange place all alone. Even my thoughts about God seem more focused on me……much more personal like it’s only God and I. I don’t know if that is good or bad, but it’s the way it is now. That does not mean that I have no thoughts of others because I very much do. God gave me a heart and a passion for others that has not burned out since the death of my husband. In fact, it has increased. But, in order for me to get some healing from my heartbreak, I have had to turn inward, come away from others, and have it just be me and God. I’m not sure how long it’s supposed to be like this, but it’s the way that it is at this time. I no longer think in terms of “we” or “us”. I think in terms of “me” because it IS just me living this life alone. And I feel like God and I are tucked away on a distant island until I get to wherever I am supposed to get in the healing of my broken heart. “There comes a time in the process of grief when grieving no longer means dwelling on the emptiness of loss. After a period of grieving and honoring the stages of grief, the emptiness of loss becomes an opening into the fullness of all that was and in some mystical sense still is. The stages between feeling the emptiness and the fullness of loss can take months, years, or decades depending on the individual. But the time spent grieving is not wasted. Grieving is like polishing rare stones and jewels. The process of going over and over the memories creates a rare and beautiful jewel, the true beauty of which had not been previously realized. There are lessons here for the life you are living now. Part of grieving is reflecting on what seemed like ordinary moments and realizing how essentially meaningful those moments were. Whether they are memories of simple meals shared or singing silly songs together, in the face of loss you realize that these were among the most significant moments of your life. What a beautiful thought that I am polishing rare stones and jewels as I go over and over memories that will result in the creation of a rare and beautiful stone! I believe that stone will be what God is now making of my life in this place that He has put me. Today we remember what happened on September 11th all those years ago. What better way to remember it than to hear widow Jennifer Sands share her story. Jennifer has written 3 books that document her journey of grief and how God worked in her life – A TEMPERED FAITH, A TEACHABLE FAITH, and A TREASURED FAITH. Jennifer did not have a personal relationship with Jesus Christ when her husband died, but through his death she made a public commitment to Christ. Please click on the link below and listen to her widow story. Watching a horse being trained has always been something that intrigues me and speaks to my heart. My husband and I use to sit and watching training shows on RFDTV every Sunday afternoon and I always found many parallels to horse training and my Christian life. The most special trainer is called a horse whisperer. A horse whisperer must have confidence and knowledge about what response he needs from the horse. In other words, he must be experienced. The whisperer must know the horse’s current training level and current experience level in relation to his goals. He must also consider the horse’s temperament and his view of people. If, for example, the horse has a negative view of people, it will take longer to regain his trust. Knowing what type of training method to use is very important to the whisperer. He has know know exactly which method is effective for that horse and must be consistent in that method of training. When the horse whisperer begins working with a horse who has never been ridden, he slowly introduces that horse to one thing at a time. Throwing a saddle blanket on his back right off the bat will frighten the horse because he is not use to any sudden moves much less having any weight on his back. A wise whisperer is patient with his horse. As the horse and the his whisperer spend time working together, the horse begins to trust him. He yields his will to the whisperer and follows his every command. I am the horse and my horse whisperer is the Holy Spirit. When I became a widow, I became this wild, unbroken horse, I went kicking and screaming into a new training ring. Sudden changes or movements frightened me. I have bucked, stomped my hooves, thrown my head around, and neighed wildly in protest. But the Holy Spirit, my own personal trainer, is experienced. He knows my temperament and my view of people. He understands me and knows exactly what method of training is going to be the most effective for me. He has this deep and abiding love for me and is never going to leave me nor forsake me much less give up on me no matter how slow I am to learn. When I stubbornly balk and paw the ground in protest, he patiently and lovingly calms me with his gentle voice knowing just what to say and then repeats the training again and again until I am ready to move on to the next thing that he wants to teach me. As time goes by, I begin to very slowly learn to trust my personal trainer.